If you're a frequent reader of the blog, you know I have a love/hate relationship with author James Patterson. LOVE his books but he needs a medical consultant-- STAT. 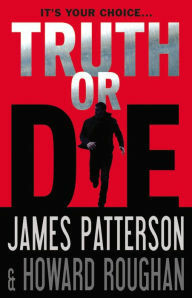 Recently, I read Truth or Die by James Patterson and Howard Roughan. Here is my Goodreads review of the novel if you're interested. What I'd like to discuss here is an interesting medical aspect that was part of the book. SPOILER ALERT. If you haven't read the book and don't want any part of the novel divulged then stop reading right now. In the novel, a journalist is murdered when she goes to see one of her sources. The question is why? What comes to light is that there has been a new drug invented to be used as a torture device to illicit confessions. In short, the drug will kill you if you don't tell the truth. The concept itself is intriguing from a fictional point of view and I do give the authors credit for brainstorming this medical scenario and the ethical implications that surround it. My issue is the way they deliver the drug-- always through an injection into the carotid artery. I'm sure this is done for dramatic effect but giving drugs via arteries is generally not done. The question is why. Let's first think of the main difference between veins and arteries. Arteries are vessels that are leaving your heart. The blood has just been oxygenated. These vessels operate under pressure-- we measure your blood pressure at arterial points. Arteries flow into smaller vessel beds. Veins lead back to your heart. Smaller veins lead to bigger vessels. The oxygen has been off loaded and the red blood cells are on the return trip for more. You have far more veins than arteries. Many drugs can be "caustic" to veins. This means the drug itself could cause irritation at the least-- loss of the blood vessel at the worst. Considering how many veins you have-- possibly losing the function of one vein probably won't be a huge deal. However, say I give a drug via your radial artery and completely destroy it. That radial artery feeds a lot of tissue in your hand-- which would die off if the artery were destroyed. That's generally what we consider poor patient care. The other thing about arteries is that they are usually deeper and harder to access in comparison to veins. As I stated above, they also operate under high pressure. You know you've hit an artery when blood backs up into your syringe-- and pulsates. Lastly, arteries carry oxygen rich blood to cells. If that blood flow is displaced for a period of time with liquid from an infusion that dilutes the bloodstream-- those tissues could become oxygen starved to the point of dying. Again, generally a bad idea for patient care. There is an alternative the authors could have used and still had dramatic effect for the book and that would have been IO or intraosseous access. This is where we drill a large needle into your bone marrow. It is considered central access and all drugs could be given this route. Also very dramatic. Remember, James, I'm available for medical consultation.